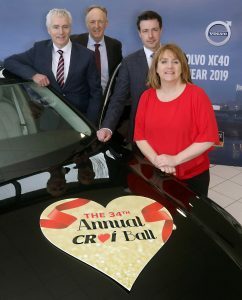 Pictured at the launch of the 34th Annual Croí Ball, (from left): Brian Kenny, Kenny Galway (Presenting Sponsor); Neil Johnson, Chief Executive, Croí; Damien Kenny, Kenny Galway (Volvo); and Christine Flanagan, Fundraising Director, Croí. The 34th Annual Croí Ball will take place on Friday, March 22 at The Galmont Hotel, Galway. This year’s event will be a night of laughter and entertainment, with a special performance by one of Ireland’s top actors and comedians (it’s a surprise!). Highlights on the night include a gin reception, four-course dinner and late-night entertainment by Electric Picnic favourite and 90’s tribute band, Smash Hits!